This monitoring survey is funded by the National Parks and Wildlife Service and the Northern Ireland Environment Agency. What is the Waterways Survey? Bat Conservation Ireland piloted the Daubenton’s Bat Waterway Survey based on the Bat Conservation Trust (UK) methodology in 2005. The survey has been continued annually in the Republic of Ireland and Northern Ireland since 2006. The aim is to assess levels of activity of Daubenton’s bat. Trend information from 2006-2017 indicates that species is currently stable. 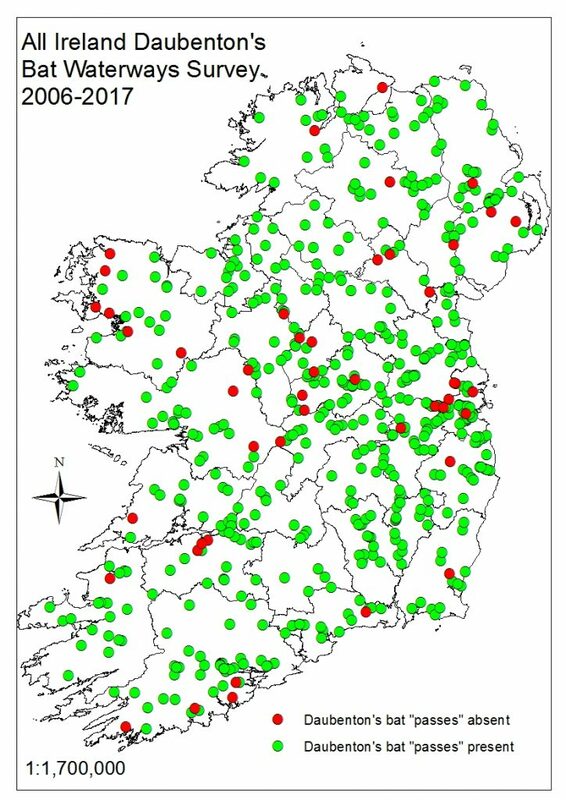 To-date hundreds of volunteer teams have participated in this survey across the island surveying their local river, canal and channels. A total of 599 waterway sites have been surveyed since 2006 and the map below shows the location of all of these 1km waterway sites. As you can see from the map, Daubenton’s bats have been recorded on all of the green dots. Can I help monitor Daubenton’s bat? Yes! Daubenton’s bats fly close to water and are easy to identify. With a little training, you can identify and count Daubenton’s bats over a waterway near you. Daubenton’s bat is easy to see because it flies typically within 30cm of the water surface, often picking up insects from the water. It usually flies back and forth along a regular flight path. If you are willing to spend a couple of summer evenings in the month of August walking along a river or canal while participating in important wildlife conservation work then this project is ideal for you! Do I need experience to be involved? No! Identifying bats on field surveys with tuneable bat detectors does requires some training. Therefore, Bat Conservation Ireland will provide you with free training prior to the survey. The training will either take the form of a short 2-3 hour course on one evening in July (training course times will be listed on the events page) or there are online training facilities that you can avail of. If you attend a course, during the course we will supply you with a volunteer pack with information on bats in Ireland, surveying techniques, how to use a bat detector, details of the monitoring methods etc. that you can read at your leisure. You can also look at the online training facilities post-training course to update your skills. But this survey is simple and easy to follow. So why not give it a go. You will be supplied with maps and recording sheets (either by post or email). Each volunteer uses his/her own torch and bat detector. There will, however, be a number of bat detectors available for volunteers who don’t have one. We recommend that you bring a mobile phone with you on the survey. You will be assigned a 1km stretch of waterway that is within 10km of the your home address. We recommend that you visit this stretch during the day (with the landowner’s permission if it is on private land) to assess the site for safety. On two evenings in August you will survey this stretch of waterway (with a survey partner), using a torch and a bat detector. All you need to do is count Daubenton’s bat activity using the bat detector and torchlight at ten points (4 minutes per survey spot) along the 1km stretch. Volunteers will then fill out Survey Results Sheets and return them, along with a map of their 1km transect, to BCIreland for processing. You will receive a report on how your participation contributed to this All Ireland Monitoring Programme. No! The survey takes on average one to one and half hours, although you will have to visit the site in advance to make sure it is suitable for the survey. A Daytime visit is really important to familiarise yourself with the transect. What if my 1km stretch is not suitable? If you cannot get access, if there is too much vegetation or if the site is unsafe you can contact us for a different site. We strongly recommend that you check out the stretch of water well in advance of the survey so that you can go to another site if necessary. We are available at all times to give advice on how to gain access and we will provide you with a letter of introduction that you can give to any landowner that details the survey and insurance cover. Can I survey a site near me? Yes. Below is a table of all of the waterway sites surveyed over the years. There are 599 waterway sites currently registered. In the table (Waterway Sites 2006-2017) you will see that the sites are colour coded (This table will be updated as volunteers claiming sites – we will do our best to ensure that it is updated as often as possible). ORANGE sites have already been claimed by volunteers currently registered to complete the survey. All of the GREEN sites are free to choose from. The sites have been ordered alphabetically according to their COUNTY location. You will also see that the waterway sites have an unique SITE CODE – please use this code to identify the waterway site that is suitable for you to claim. So for example, if you are located in Co. Cavan and are living near Cootehill, the site code 1248 located at Rathkenny Bridge on the Annalee River could be suitable. Therefore you email info@batconservationireland.org with your choice and Tina will get back to you. If none of the currently listed waterway sites are suitable or you are unsure what river or canal waterway site is located near you, please email for clarification. On the other-hand, if none of the listed waterways sites are near you and/or you have a waterway site in mind, please contact the same email address to set up a new waterway site. Read the Training Presentation and watch the training video. If this sounds like something your like to get involved in, follow the remaining steps listed below. Check out the list of water way sites (list is above in the section “Can I survey a site near me?”). Book a site or email info@batconservationireland.org for a new one near you. Visit your chosen site in the daytime and map your walking transect. Please download the DayTimeSurveyForm. Here is a RiskAssessmentSheet_Waterways to use during your daytime visit. Visit on two evenings in the month of August and strictly follow the survey protocol. For more details please read the Instruction Manual. Check the sunset time for your location here by clicking the one of the following locations: Leinster, Ulster, Connaght or Munster. Please download the NightTimeSurveyForm. Return your survey results to BCIreland for processing. Post or email, whichever is most suitable. If you have borrowed a bat detector, please return by post to the address on the night time survey form. Have you used a bat detector before? Do you have the use of a bat detector?